Post your favorite projects on Instagram, or in any of our Facebook groups making sure you tell us which of the three categories above the project fits best. You can enter as many times as you wish, in as many categories as you wish, by August 3rd. Open to all countries. Good Luck! We are looking for strong design ability, stellar photography, and creative use of product. We do provide lots of gorgeous product multiple times per year and ask for three projects per month in exchange. We work hard to make our design team experience one of the VERY BEST out there! 1. Do your thing. Stick to your style. It really shows when you love what you do! Don't try to guess what Prima wants. 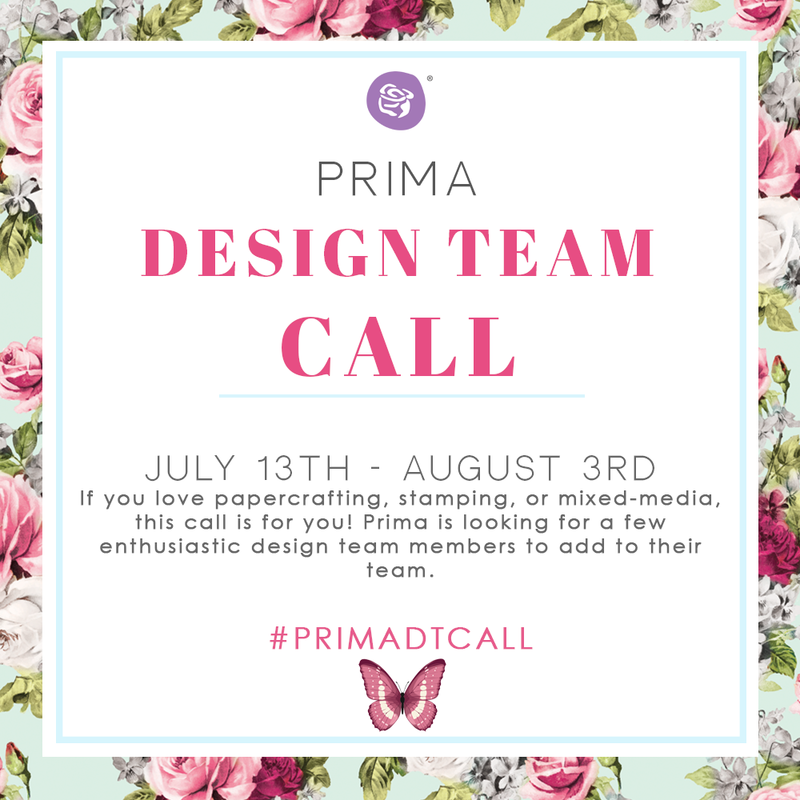 I have heard from so many designers, "But, my work is nothing like what I thought Prima would pick!" Yep, that is because you are unique and caught our eye! 2. Improve your photos! When you work so hard to create a project shouldn't that be presented in the best light possible? Practice taking project photos in natural light: near a window, or in a garage with the door open. Stand directly over the layout, or stage a little display to create more interest with a card or tag. Avoid direct overhead lighting and bright sunlight. We have team members who take their photos with their smart phones, yet their displays are creative and they always catch natural light so the photos need minimal editing. Great photography/editing can go a long way! 3. There will be a lot of entries and not everyone will be chosen. I have been there. It is so disheartening to not make a team you really love. When that happened to me I gave myself a little pep talk. Many times it isn't YOU! If it was just based on talent Prima's team would be in the thousands...so be kind to yourself and try, try again!